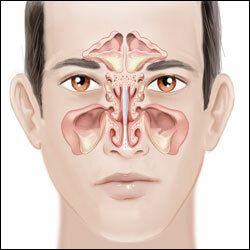 Acute sinusitis becomes chronic when you have frequent sinusitis, or the infection lasts more than three months. Symptoms of chronic sinusitis may be less severe than those of acute, but untreated chronic sinusitis can cause damage to the sinuses and cheekbones that sometimes can require sinus surgery to repair. Antibiotic therapy for bacterial sinusitis may be an appropriate treatment for your sinusitis. If your ENT thinks that you have chronic sinusitis, intensive antibiotic therapy may be prescribed. However, if medical therapy fails, in-office sinus surgery under local anesthesia may be needed to eliminate physical obstructions that may contribute to sinusitis. For more information on Sinus Surgery in the Thousand Oaks, Simi Valley, Oxnard, and Camarillo, CA area call West Coast ENT Head and Neck Surgery today!